A few weeks back I wrote about using a market-driven constraint to force Magic: the Gathering players to innovate in deckbuilding. The gist of it was: if players can only build decks in which the sum of the card values is under a particular real money value, then as certain cards become popular (and thus expensive), they become less viable for use in players' decks. Consequently, players would be highly rewarded if they could put seldom used cards to good use in their decks. As I mentioned before, nearly every competitive game has some sort of tiering, whereby options are ranked based on what players collectively believe are the best options. Whether this occurs about which cards and decks are the best in Magic, or about whether which characters are the best in Super Smash Brothers, it almost always entails groupthink at some level: players believe that these are the best options, so that's all they ever play. Of course, sometimes tiering occurs simply because the options are not balanced well. But whatever the cause, tiering is a shame because it decreases what players can choose to play and still hope to win. Using a (pseudo) market-driven incentive system might eliminate tiering, and have the added benefit of self-balancing players' choices. I'm going to give another example of how it might be used in my favorite game: Dota 2. Dota 2 is an updated version of Defense of the Ancients, a custom map for Warcraft III that single-handedly invented the Multiplayer Online Battle Arena (MOBA) genre, of which we are seeing more and more these days. Dota 2, like most of the MOBAs out there, pits two teams of players against each other in hour-long matches. At the start of a match, each player picks a "hero" (character) to play from over 100 choices. 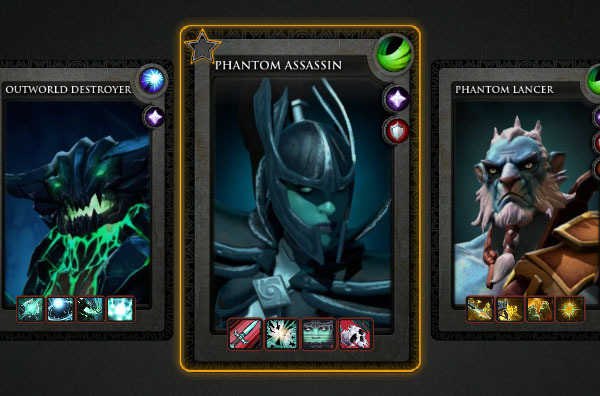 Each hero is unlike the others, with four unique special abilities. Over the course of a match, players kill computer-controlled units and enemy heroes for gold and experience, level up, and buy items for use in the duration of the match. Unfortunately, as is almost inevitable in a game with over 100 distinct characters, they're not all balanced perfectly. Since Dota 2 is such a competitive game, these imbalances quickly become known, and many of the heroes fall by the wayside. It's important to note that at the start of each match, players receive a small sum of gold with which to buy items to begin the game. Currently, if a player presses the "random" button to receive a random hero instead of choosing one, he or she starts with 250 extra gold. My concept is an extension to this bonus, but instead of paying players to randomly select a hero, this solution pays players more to choose heroes that are less frequently played. In theory, if heroes were perfectly balanced and players held them in equal regard, each hero would be picked 1% of the time (assuming 100 heroes). At the start of each week the game would take a snapshot of hero pick rates. Heroes that are picked more than 2% of the time will receive the current 600 starting gold. Heroes that are picked 0% of the time will get 1500 starting gold. Other pick rates payoff on a sliding scale between the two. This way, there is a huge incentive to find which heroes that aren't played are overlooked gems (or have unexplored potential), and which are actually poorly balanced. Finally, there is an added benefit of extra gold perhaps making underpowered heroes viable. Competitive online games have the power to collect data like never before, and data like win rates and pick rates are being used to inform design. I think it should be used for more than informing design: we should actually be incorporating data into game mechanics! Dota did not single handedly invent any new genre. Dota was a remade version of Aeon of Strife, a warcraft 3 map with a lot of improvements because of the superiority of the warcraft 3 engine. Then the map was remade a couple of times. Then finally Dota Allstars was created ( and a bunch of iterations for it also ) which is the most popular "started the Moba genre" untruth. The imbalance in one vs one games is quite the problem. But I can't see why would it affect a five man team game like Dota 2. 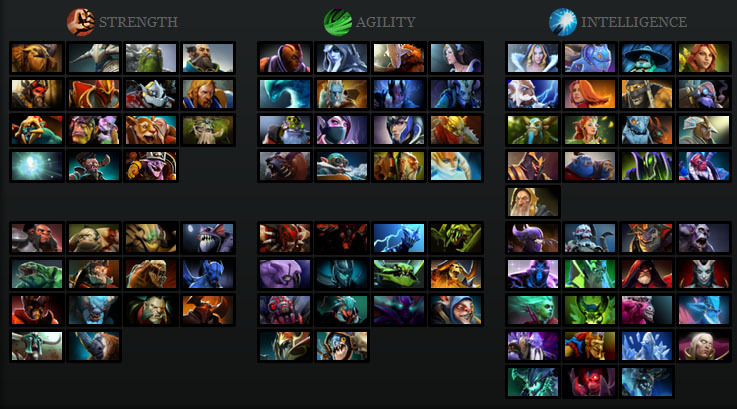 Having a wide array of heroes to play with gives you a lot of strategic options. Playing against certain heroes requires certain tactics. Stating the obvious but bear with me. If all the characters were balanced perfectly - either team picks any 5 characters and the game starts, thus reducing the whole strategic part of the game wildly. Having some characters more powerful than others ( a rock paper scissors situation ) has a great impact on the strategic part of the game aka selecting your character. Basically the result of the game could be weighted towards one of the teams before the game actually starts. But what if - the imbalance doesn't create a rock paper scissors situation, just a character is more powerful than the others ( not blatantly but just enough to make it a more viable choice in fulfilling some role in the team ) - it clearly becomes a more favorable option for more people. But when you're facing another character that is stronger than yours but for some reason you won't use it, you will have to deal with him somehow. Thus coming the second benefit imbalance brings to the table - tactics. With stronger foes you need better tactics, so a imbalanced character makes people devise new tactics against them. This impacts the game greatly in two ways. Second - meta game. With as wide array of characters as in todays MOBA games - those situations are all over the place. New tactics are created every single day, the balance is shifted around and the gameplay evolves at all times. This keeps the game from getting stale and people quitting and is the key reason why the player base of MOBA games just exploded recently. 1. Most imbalances are not one hero being strictly better than others, but instead one hero being stronger in some aspects than others and weaker in others. When combined in a 5 person team these differences can even out (when chosen well). 2. Some heroes are strictly better or worse than others. These heroes are not problems because players will compensate for these heroes by devising new tactics to combat against them. My thoughts: Many heroes do indeed have such tradeoffs. However, there are also many heroes that are too strong or too weak, simply by their numbers. This is why you see nerfs to things like stat scaling in patches. While it is an important part of gameplay to learn to counter such heroes with in game tactics, that doesn't mean it's good design to have heroes that are too strong or too weak in the game. This is especially true for heroes that are generally weaker than others. It's worth noting that just as strategies can be made to counter overpowered heroes, some "underpowered" heroes can be really good but are underutilized because people don't know how to play them well. The beauty of the system I proposed in the post is that it adjusts! If a hero isn't ACTUALLY weak, but just underutilized, it incentivizes players to experiment and find how to use it effectively with extra gold. As soon as it can be used effectively, players will pick the hero more and the bonus gold will reduce. If a hero truly is underpowered, then it will be picked fairly infrequently, and the bonus gold will exist to try to make it competitive. Could you explain why the weekly snapshot? Why not just represent every character on a daily snapshot or at-instance snap-shot basis? Maybe the answer to the first will answer the second, but I think it's worth it to ask how you think this might effect weekly or daily challenge matches or special events games. 1. Practically, I think it will be overwhelming to ask players to check every single hero's bonus gold at the start of each game. Much better to have players be able to check the bonus gold at the start of the week (either in game or online) and have that experience remain static for the week. 2. Related: the weekly snapshot allows players to get a gauge on which heroes are undervalued and overvalued that week, and react to it. It allows players to experiment; they will think, for example that +100 starting gold makes Chen IMBA, and they'll be able to play several games under the same circumstances to see if they are right. As for special events, I would imagine that this mode would have to be disabled for those, because as you rightly note, if it was a PA-centric event (like the one that's running now) her bonus gold would be really low.